Dr Duyilemi Chris Ajonijebu graduated with a PhD in Physiology. Dr Duyilemi Chris Ajonijebu was always determined to venture out beyond teaching into the challenging field of research and proof of his success in doing that was evident for all to see when he was awarded a Doctor of Philosophy (Physiology) degree. 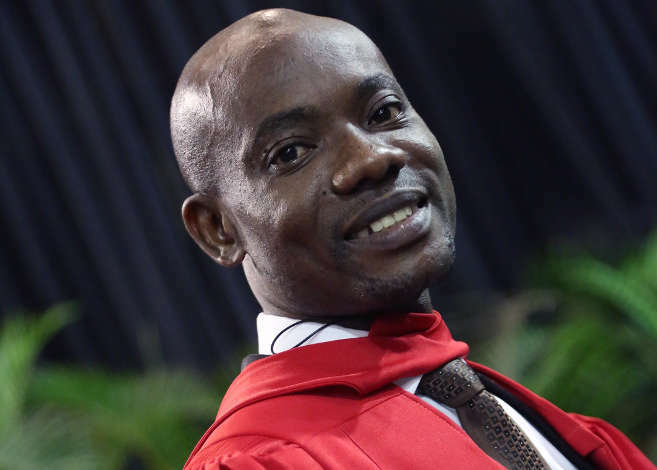 Ajonijebu’s PhD study, titled: Characterising Epigenetic Alterations Following Cocaine Consumption, focused on the epigenome as an interface where drugs and environmental factors interact to influence gene expression that determines drug-related phenotypes. According to Ajonijebu, this is the first study to provide evidence that epigenetic changes associated with cocaine exposure in free or non-free living conditions can be inherited by drug-naïve offspring mice. His work further attempted to explain the patterns of inheritance – whether paternal or maternal. Ajonijebu thanked the South African Police Service, the KwaZulu-Natal Department of Health, and his supervisors, Professor William Daniels and Professor Musa Mabandla of UKZN’s School of Laboratory Medicine and Medical Sciences, for their support. He also thanked Mr Prenan Pillay and Dr Oualid Abboussi.